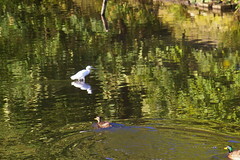 This morning (Monday) one of my fellow bird watchers on the patch observed the egret being mobbed b y magpies. Tonight there were lots of loose white feathers and through binoculars I observed a perfect white fan that could only have been a birds wing blowing up from an unidentifiable white shape at the waters edge before it fell back and the whole white shape slowly submerged into the pond. It looked rather as if the outcome of the mobbing had proved fatal for the egret.